Size: 2070 sq.ft. - 2529 sq.ft. 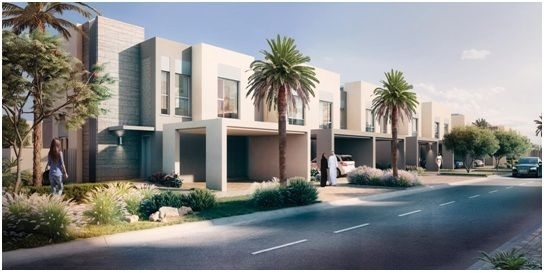 Saffron Townhouses is the very first townhouse community in Emaar South. Emaar South construction is taking place at Dubai South by Dubai based no.1 developer Emaar Developer. Emaar South is a master development of 7 Square Meter project consists of Villas, Apartments and townhouses with ample space for public transport network, bicycle and walking trails. This wonderful nature-friendly project is influenced by villas communities like The Reem, Arabian Ranches and The Springs. The Saffron townhouses are linked to an 18-hole championship golf course at walking distance. The project has an estimated handover date of Q4 2020. The Saffron by Emaaris nestled amongst ample green space and many parks of Emaar South.The project holds stunning collection of large windows townhouses with beautifully appearance of private gardens. The residents can have the choices of 3 Bedroom and 4 bedroom accommodation that are designed with flair and within arm’s reach of nature.Saffron includes the facility of best class interiors making it an ideal place for families to live in with the maximized space. These excellent layouts of "Saffron" are being constructed with the sizes from 2071 Square Feet to 2528 Square Feet. Saffron homes can be obtained at the affordable price of AED 1,485,888. Emaar is among the top ten property developers in Dubai. Emaar Properties is one of the world's most appreciated and an esteemed real estate development company. Emaar Properties isassociated with other high class projects in Dubai that includes Dubai Marina Mall Complex, Panorama at The Views, Travo, Al MuradTowers,Mosela, BurjKhalifa, Il Primo, Emaar Business Park Building 3, Address Boulevard, The Lofts, Boulevard Central,Zanzebeel 3, Miska 5, Reehan 8 and CreeksideView.Emaar Group is known as the pioneers of master plan communities in Dubai. Emaar South is a mixed-use development being developed by Emaar in Dubai South. Emaar South development lies between Dubai &Abu Dhabi. The overall development will feature apartments, tiered homes, townhouses and villas. The community will also have an 18-hole championship golf course that will be surrounded by the villas and apartmentsand is very close to the EXPO 2020 site.Saffron townhouses are interconnected through tree-lined boulevards, walking & bicycle trails. Emaar South layouts also provide fully integrated transport system near Dubai metro link. Emaar South is conveniently located close to the Al Maktoum international airport in Dubai South. Emaar South is located within Emirates flagship urban project known as Dubai South, Dubai South issmart city thatspread across 145 square kilometre and is set to become a pivotal hub in the global economy. This Pivotal hub is planned to servewith retail, dining and entertainment options at your doorstepwithin easy reach at Emaar South. Saffron - The residential townhouses are placed in Emaar South community, Mohammad Bin Zayed Road, Dubai Bypass Road, Dubai South, United Arab Emirates. Saffron Townhouses by Emaar is offering most desired luxurious facilities - Community View, Covered parking, Garden view, Golf view, Maid's room, Balcony, BBQ area, Built in wardrobes, Central A/C, Maintenance, Near airport, Near Golf, Near Hospital, Near mall, Near Mosque, Near public transportation, Near restaurants, Swimming pool, Near school, Near supermarket, Near veterinary, Pets allowed, Public park, Security,With in compound, Within a Compound.